Finally, it’s spring. Summer was trying to sneak in for a few days, and my baby lettuce plants didn’t like it. My basil didn’t fare well with the cold snaps either. I’m hoping that my container garden will survive my not-quite-green thumb over the next few months, but if my plants don’t make it, at least the Fredericksburg farmers’ market is a 10-minute walk away. I made a complete farmers’ market meal Saturday for dinner, after walking to the budding spring market earlier in the morning. Only a few vendors were out, but the variety was nice: spring vegetables and those that have been stored in root cellars, eggs and meats, flowers and baked goods. I picked up asparagus (they were so thin and gorgeous), spring onions, roasted garlic goat cheese, multicolored farm eggs and a pot of oregano to add to my growing herb garden. I wanted to get some of these pretty flowers, but of course, I had already run out of cash. And my housemate keeps our kitchen table adorned with a vase of flowers from our yard — right now, there are gorgeous dark purple irises. 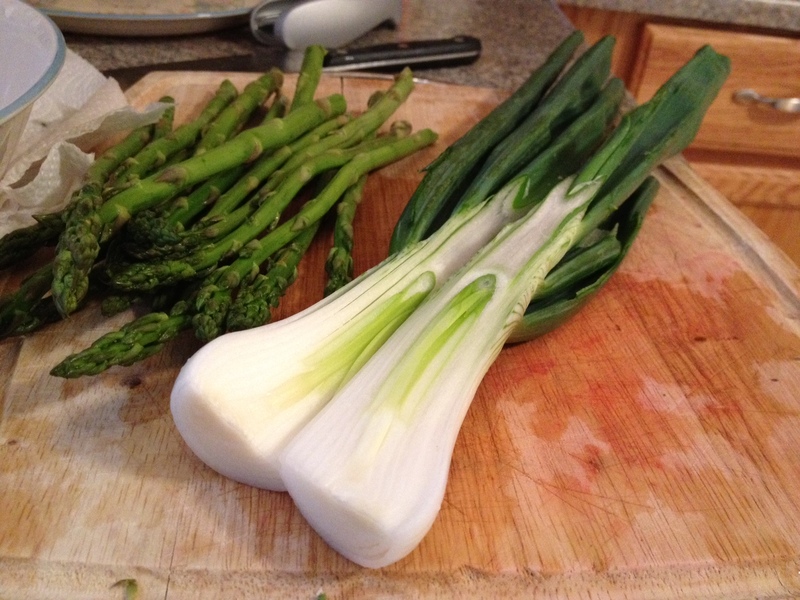 What to do with spring onions? I had thought about risotto or pasta. But grilling/roasting was a recommendation from someone at the market. 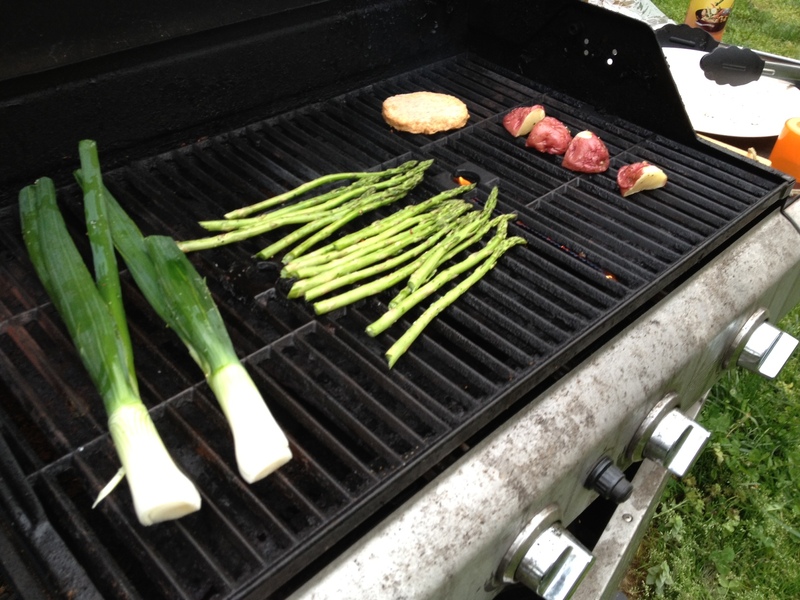 I love grilled veggies, so I decided that my whole meal would come straight off our gas grill. I got to enjoy the nice weather too, though the sky started darkening. 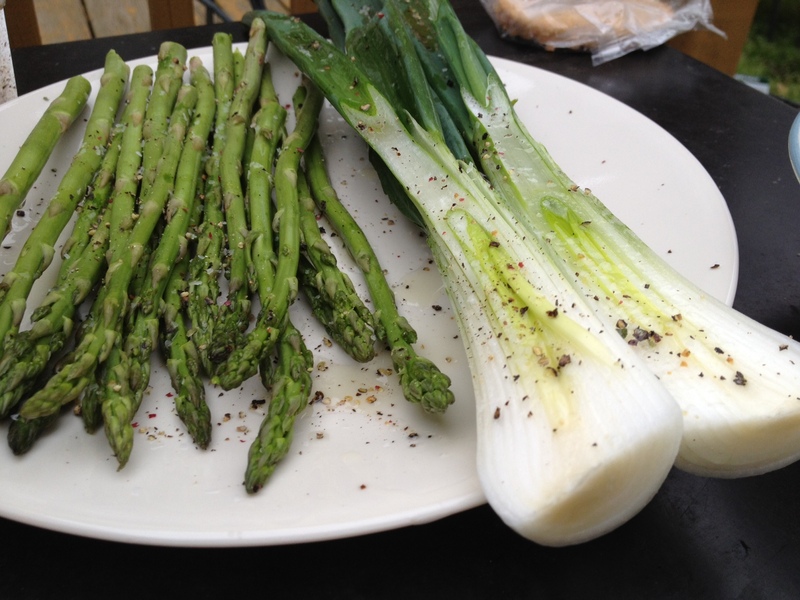 That’s olive oil, salt and pepper on top of the asparagus and spring onions. 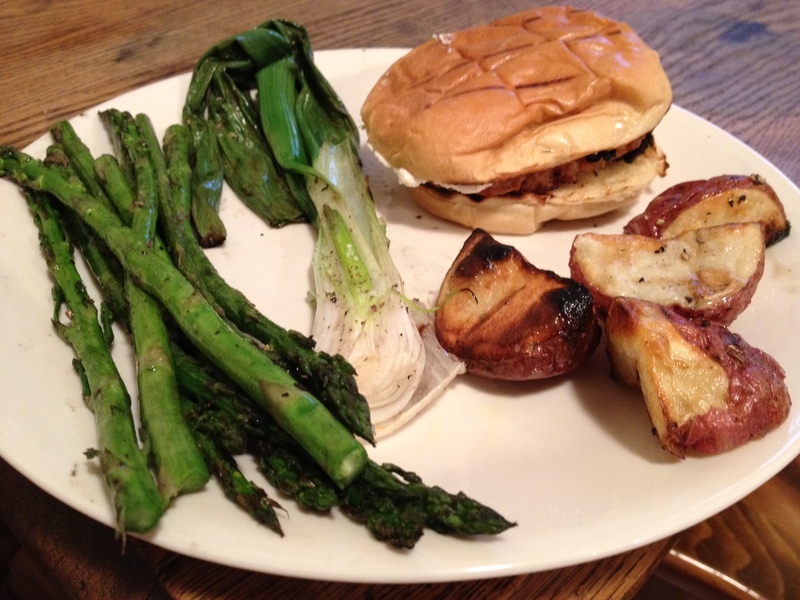 I chopped off the tops of the onions, and the bottoms of the asparagus. The pepper is my favorite Trader Joe’s rainbow pepper in a grinder. Mmm. Everything is better with some color. The salt is TJ’s pink salt, too! These add so much more fun to my food. And flavor. 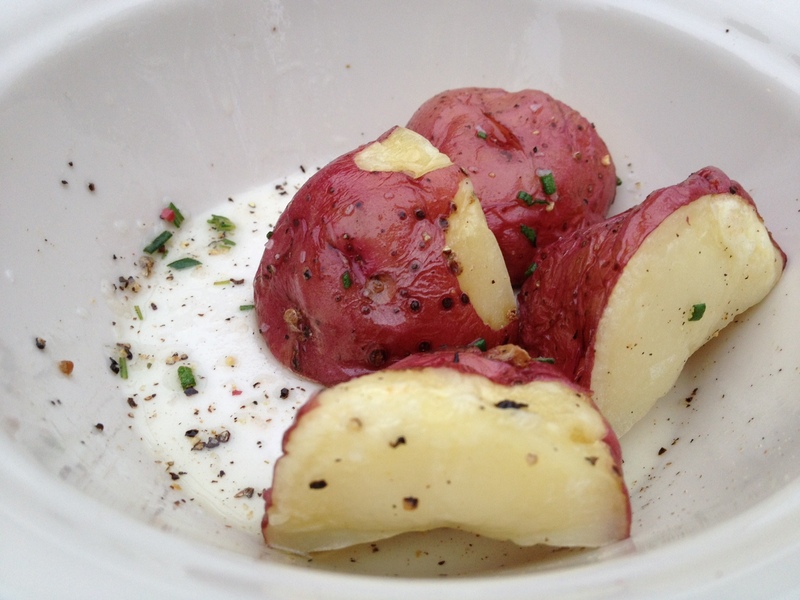 I quartered a red potato from a previous farmers’ market visit, microwaved it for 5 minutes or so to give it a head start, and then covered it in olive oil, salt, pepper and a little fresh rosemary. All these simply marinated veggies went on the grill — along with a veggie burger that’s been sitting in my freezer forever. I needed to use it, and I figured protein would be a good addition. I also toasted a bun on the grill, and smeared it with plenty of the roasted garlic goat cheese. Mmm. I could eat that cheese everyday, for every meal. The onions took about 5 minutes or so per side, while the asparagus required just a few minutes per side. Total, I probably cooked for just about 15 minutes. So simple. Very little cleanup too. 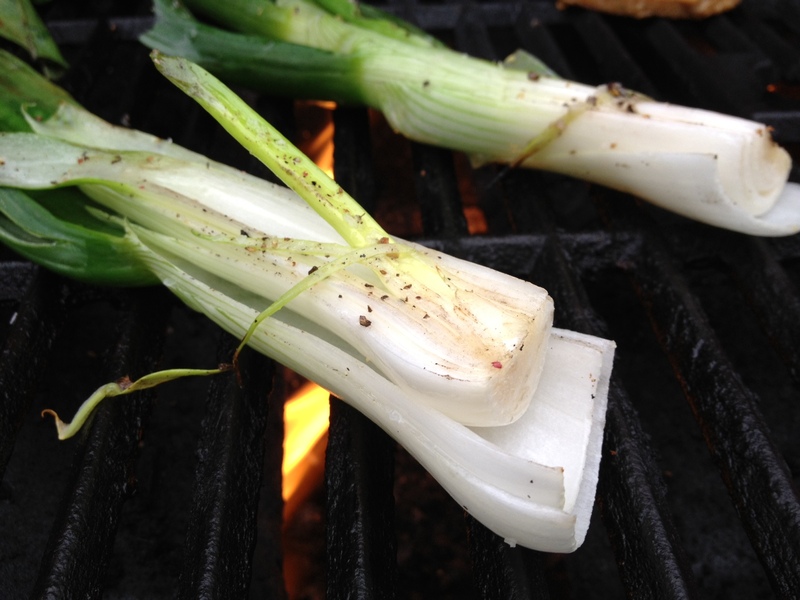 Grilling made the spring onions sweet and complex, charred but creamy. And so delicious. 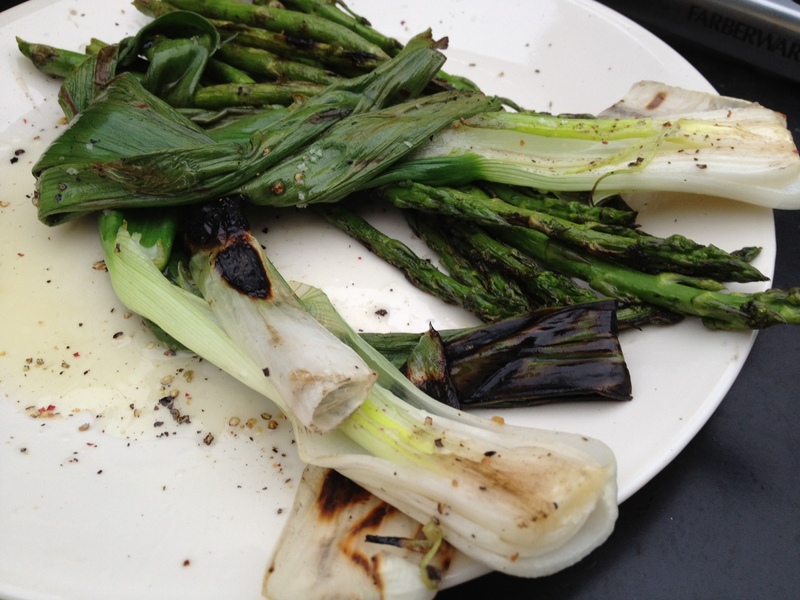 And asparagus is always good grilled — I don’t know if there is a wrong way to cook asparagus. 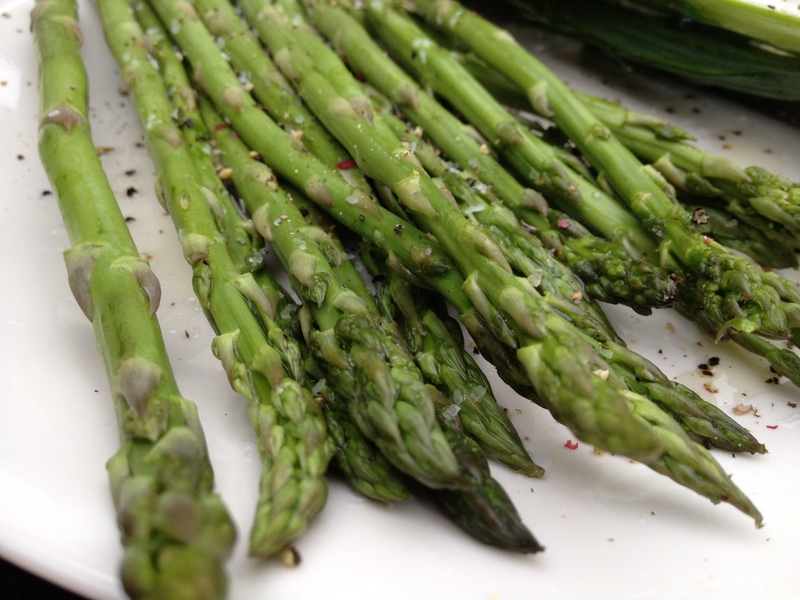 ‹ PreviousPests: Get out of my garden!